The Poplar Kids are taking over their middle school in this uproariously funny sequel to Payback on Poplar Lane, which NYT bestselling author Chris Grabenstein called "the funniest book I've read in years." Clover O'Reilly is super psyched to run for class president. As the second oldest of five sisters, she struggles to be heard in her ginormous family. But when you are president of the seventh grade, everyone has listen to you! Comedy magician Mike the Unusual feels confident onstage. Offstage, life can be tricky. It's okay that his classmates don't understand him, but it bugs him when his dad suggests he needs more friends. Is he willing to give up his passion to win friends . . . and votes? 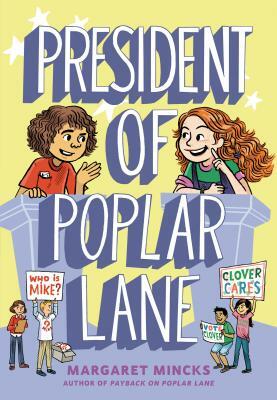 Clover and Mike compete to rule their school in this sequel to Payback on Poplar Lane that's filled with scheming advisers, political gaffes, missteps that lead to big laughs... and campaign sabotage! Margaret Mincks grew up the second oldest of eight kids. When she wasn't swimming, acting, making up slightly disturbing songs, or filming B-movie parodies with siblings and friends, she was writing stories. After graduating from the University of Virginia, she moved to Chicago to perform improv comedy with the iO Theater. She later worked at Spider, a literary magazine for six- to nine-year-olds, as an editor. She now lives in Florida with her family.